This is part of a guide to the identification of particles seen in samples of free particles. This file includes elongated particles that have barbs along their length. Click on the image that most closely fits what you see to see similar examples that may more closely fit the particle you are trying to identify. These are isotropic particles that have barbs along their length. 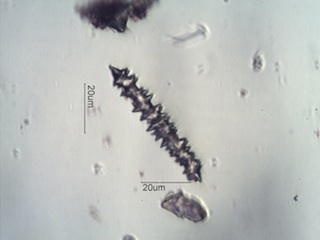 Silica phytoliths are the most common members of this group but it also includes some sponge spicules and arachnid setae. These particles are bright between crossed polarizing filters (Anisotropic) and that have barbs along their length. Insect fibers, bird feather barbules, and plant hairs are the most common members of this group.